Apistogramma nijsenni are charming little cichlids that have been kept by aquarists since the late 1970’s. They were bred in captivity for the first time in 1983 and you can today obtain captive bred as well as wild caught specimens for your aquarium. They are appreciated for their boldness; if you provide them with a well decorated aquarium where they feel safe they will spend a lot of time out in the open, displaying their entertaining behaviors. Male Apistogramma nijsenni can reach a length of 3 inches as adults while the females normally stay around 2 inches. The male fish is light blue, sports a vibrantly yellow chest and belly and have a rounded caudal fin decorated with a semicircular red fringe. The female has a yellow body color, and just like the male, she sports a red semicircular fringe at the outer edge of her caudal fin. In some specimens, the fringe will be bright yellow rather than red. Females are also decorated with black spots on the gill-cover and a big round or oval blotch on the base of the tail. There is a big lateral blotch on her body which will turn into a light green shade during courtship. Apistogramma nijsenni is not a big fish and you can house it in a comparatively small aquarium, provided of course that you know how to keep the water quality up in a small aquarium. It needs a well decorated aquarium with plenty of hiding spots and will become utterly shy in a barren aquarium. You can for instance use driftwood and densely grown plants. There should also be at least one cave for each fish. A rich assortment of everyday items will work as caves, e.g. a flowerpot or the base of a bottle. Be careful with items that might pollute the water. Just like all the other Apistogramma cichlids, Apistogramma nijsenni will die if you allow the water quality to drop. Efficient filtration should therefore be combined with frequent water changes. The water temperature should be kept around 78 degrees F. If your specimens are wild caught, they should be kept in really soft and acidic water. If your specimens have been aquarium raised, they may have grown accustomed to harder and less acidic water and may very well do fine in ordinary tap water as long as you avoid the extremes. Lowering water hardiness and pH-value is however still a good idea if you want to breed Apistogramma nijsenni. If you want to keep your Apistogramma nijsenni happy and healthy, you should provide them with a varied diet. You can for instance use a high-quality flake food as a base and supplement it with brine shrimp, blood worms, black worms, etcetera. Occasional servings of live food will be highly appreciated, but for the day-to-day feedings you can use frozen foods. An improper diet can cause bloat, which is often fatal in Apistogramma nijsenni. Apistogramma nijsenni fry will start displaying sexual differences at a fairly young age if kept on a nutritious diet. Females as small as 1 ¼ inch can actually start to show a more pronounced black coloration at the anterior part of their ventral fins. As mentioned above, soft water with a low pH-value is known to coax Apistogramma nijsenni into spawning. Some specimens will always require soft, acidic water to spawn, while others are capable of spawning in ordinary tap water. There are breeders who have managed to spawn Apistogramma nijsenni in tap water simply by keeping the levels of organic waste extremely low. 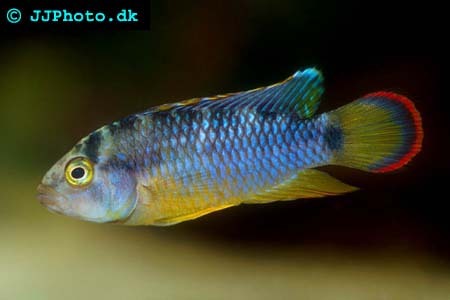 If you want to provide your Apistogramma nijsenni cichlids with soft, acidic water, there are several methods available. One way to go about is to gather rain water and use it to carry out a series of water changes. Another method is to simply purchase RO water (water that has been purified using reverse osmosis) and use it instead of rain water. If you plan on keeping and breeding a lot of fish that appreciates soft and acidic water, you can actually purchase an RO unit and manufacture your own RO water at home. Another technique is to filter the water through peat moss – a little messy but a lot cheaper! Lastly, a trip to the aquarium shop can provide you with a wealth of various chemicals that can be used to alter the overall chemistry in your aquarium in all sorts of directions. When kept in favorable conditions and fed a nutritious diet, Apistogramma nijsenni cichlids can become sexually mature and start forming pairs at an age of seven months. When this happens, the aquarium can turn into a hostile place and if you keep a group of Apistogramma nijsenni, you should be prepared to separate the couples if the situation becomes too violent. Including a lot of hiding spots and making it possible for each couple to claim its own separate territory is very important. During courtship, the female will display an intense yellow breeding dress and black blotching of her cheek, her mid body and the base of her tail. Her caudal fin will have a yellow or red semicircular edge. She will try to entice the male by showing off in front of him and effortlessly try to get him to her preferred breeding site. If the female suddenly becomes very protective of a cave in the aquarium and spend most of her time inside, spawning has probably occurred and adhesive eggs have been attached to the cave ceiling. You should let the parents stay with their offspring because they will care for the eggs and protect the territory from hungry fish. If the water temperature is kept at 78 degrees F, the eggs will normally hatch within two days and the eggs will be free swimming within five days. The mother will start herding them around, and at this point she can become quite hostile towards the father and evacuating him to another aquarium may be necessary. The same is true for any other adult fish in the aquarium. In many cases, the male will however be able to stay without being badly beaten and the female will eventually start trusting him again and let him help her guard the fry. If you have a planted aquarium, the fry will start feeding on microscopic food particles among the plants. Try giving them a small amount newly hatched brine shrimp and see if they eat. If they refuse to eat, remove all the uneaten food and try again the following day. The female can be ready to spawn again within five weeks after her first spawning. This is important to keep in mind, because if she spawns again, she will kill all the fry from her previous batch to safeguard her new offspring. The fry should therefore never be allowed to stay with the female for more than four weeks, and should be removed even earlier if you notice any signs of the female being gravid or engaged in courting behavior. A 10 gallon aquarium is large enough to raise the fry in if you manage to keep the water quality up. When kept in suitable conditions and fed a varied, nutritious diet, they can reach a length of 1 ¼ inch by the age of three months. Eventually, they must of course be moved to a bigger aquarium or separated into several aquariums.